The Navigator pane is the tree-view pane positioned on the left side of the client by default. 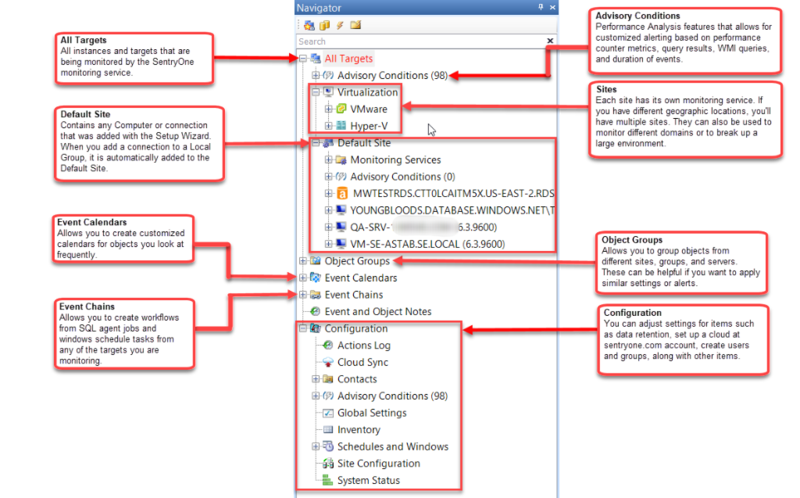 The various nodes within the Navigator pane are used as the starting point in directing many functions of the SentryOne client, such as viewing an event calendar or a performance analysis dashboard. The navigator nodes are also used as the starting point to access the various levels of conditions and settings within the Alerting and Responses System. Right-clicking on a node accesses its context menu. Each object in your SentryOne enterprise has an associated icon. Several of the node icons in the Navigator pane vary based on conditions, such as instance or watched status. Indicates that the instance has an online status. Indicates that the instance has an offline status. Indicates that the instance requires attention. Often associated with the SQL Server agent being offline. Indicates that the instance has a watched status, but it isn't being actively monitored. This can happen if the monitoring service has stopped or the instance belongs to a site without an active monitoring service. Note: Instance status is determined by the SentryOne Monitoring Service's ability to collect information from the instance. The following is a simplified version of how instance status information is obtained and displayed in the SentryOne client. The SentryOne monitoring service gathers instance status information. The instance status information is written to the SentryOne database. The SentryOne client retrieves the instance status information from the database and displays it. Note: Select any instance node to access additional status information. A tool tip displays the status (offline/online), the last monitoring service, instance time, and any applicable error information. Important: A target must be set to watched before SentryOne begins monitoring it. To watch a target, right-click the target. 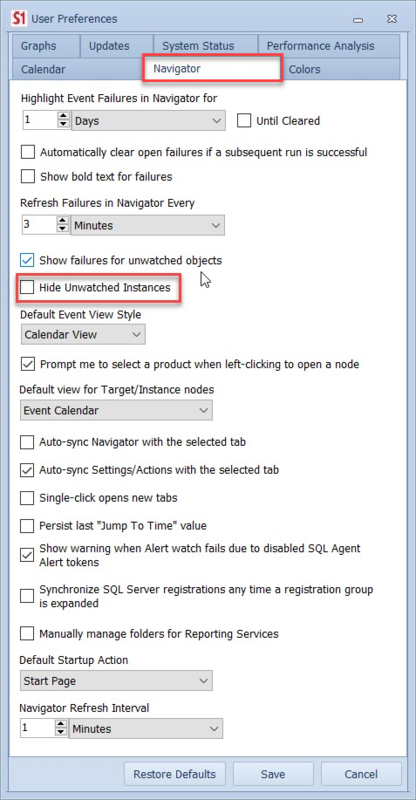 You can also hide unwatched targets so they don't display in the Navigator pane by selecting Tools > User Preferences > Navigator > Hide Unwatched Instances. For more information about watching targets and objects, see the Watching Instances and Objects topic. Indicates that the instance/object isn't being watched. Indicates that instance/object is being watched. Instance types are represented with various icons. If the label text for a node is red it indicates that an event object has a recent failure. Failures cascade from the object level up to the highest group level containing the object. 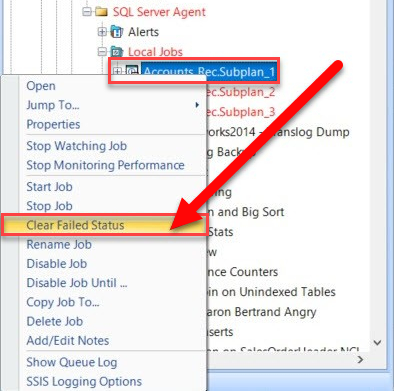 Right-click on the event object, and select Cleared Failed Status to clear a job failure. Adjust how long failures display in the Navigator pane through Tools > User Preferences > Navigator > Highlight Event Failures in Navigator for. 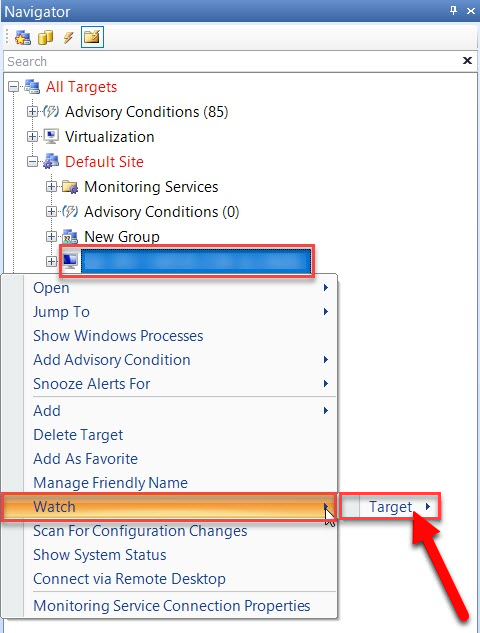 All Targets (global), sites, groups, and targets, can be snoozed with a right-click context menu in the Navigator pane. Snoozing an object prevents any SentryOne actions from occurring while the snooze is in effect. The snooze status is inherited by objects lower in the hierarchy. 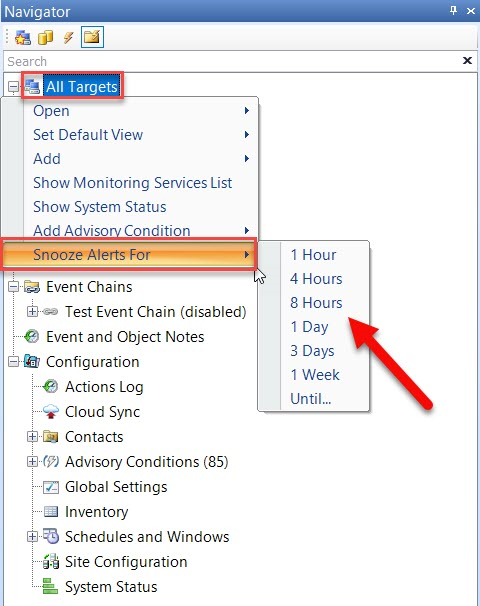 For example, snoozing the All Targets (global) node effectively stops all SentryOne actions in the environment for the duration of the snooze. End snooze early by right-clicking a snoozed object. Note: Monitor the Snooze status of an object with the Audit: Settings Changed audit condition and Log to Database action. With this condition and action configured, changing the Snooze status of an object results in a record of this change logged to the database. For more information about snoozing an object, see the Conditions pane topic.